Every Tuesday, I sell our lamb at the Tuesday Market behind Thorne's Marketplace in Northampton, Massachusetts. It is a lively market but honestly, I can never tell how I am going to do sales-wise. I just try to go into it with an open mind and not stress about the dollar outcome each week. It's hard because our farm is our business and livelihood but I try not to get too discouraged. One way I keep the stress out of my mind is by bringing something with me to stitch. It's a nice chunk of time when I am in one place and depending on the traffic, sometimes I get a lot of work done. Yesterday, I had a visit from Cheryl who has just begun stitching again. She is a knitter but she has been inspired to pick up a needle and thread. 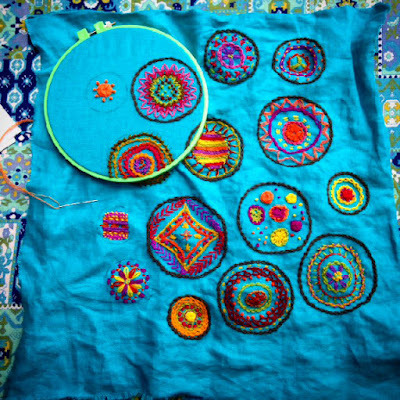 She purchased my Circles Sampler kit and ran out of a color of thread. I brought it with me and so I got to see her progress so far. Here it is. Cheryl is so excited about her project. (Here is the link to order the kit.) As her skills have increased, she is doing what I wish every stitcher would do - making up stitch combos up on her own. Cheryl is winging it! Go Cheryl. She has even signed up for my Crewel Embroidery Retreat August 8/9. I look forward to spending more time with her. You can sign up too! Here is the link. 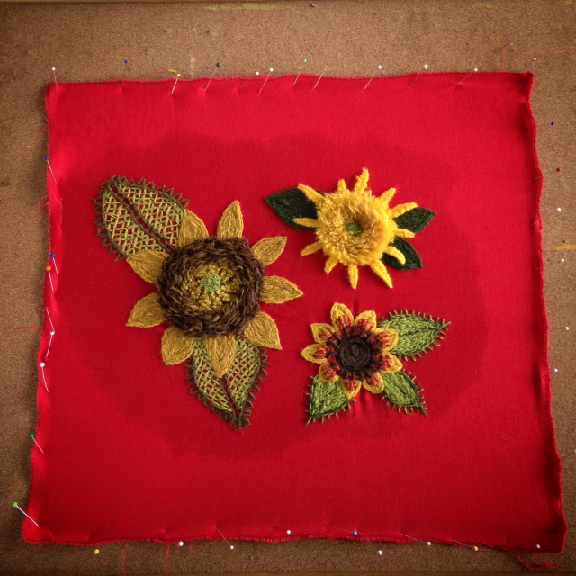 Last year, I worked on several different Crewel Embroidery projects at the Tuesday Market, including my Sunflower Pillow that I have been sharing here, here, and here over the past couple months. I finally had the chance to sew the backing on and take a finished shot of it. Here it is being blocked before sewing. Here is a Tutorial for sewing a Removable Fabric Pillow Cover. AND.... Here is the finished Sunflower Pillow. At this time, I do not have a PDF Pattern or kit for the Crewel Sunflower Pillow. Let me know in the comments or in an email if you would be interested in buying it. Depending on the interest, I may or may not put the effort in. I'll be back with more tomorrow about my adventures at the Tuesday Market. I have a very fun little story to share with you all. Looks way too NICE to lean against! Loving the TEXTURE! I love the sunflowers and would love to purchase a pattern! Love all the sunflowers in your work! 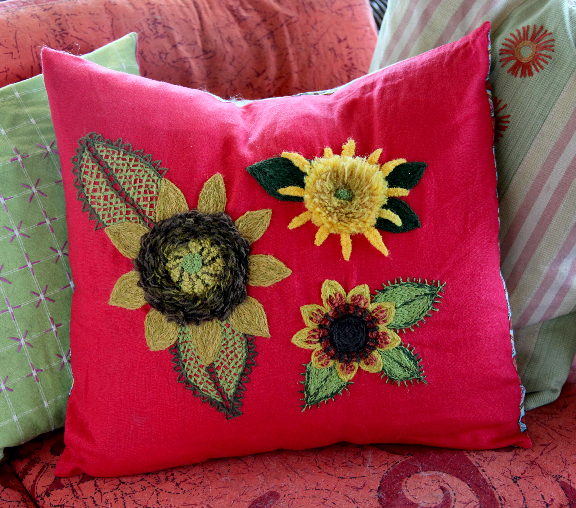 Beautiful stitching ~ Beautiful Pillow for us sunflower loving people! I so wish I lived in your area. I love sunflowers (have a room painted sunflower yellow) and love your pillow. I would be interested in a pdf for it.